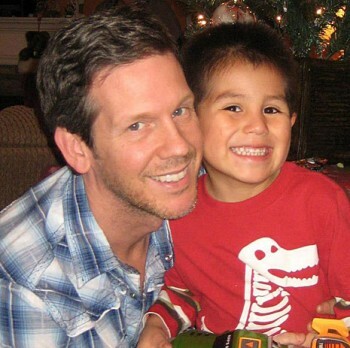 Bryant Huddleston, with his son Haven. I remember vividly, a moment as a thirteen or fourteen-year-old Arkansas kid, sitting on a pew at the First Baptist Church. While the preacher delivered his message, I was busy praying. I was asking God to make me bisexual. Not for acceptance, and not for fear of sinning, but because for my young, sheltered mind, it was the only way to one day become a father. Bryant Huddleston, with his son. The Jesus I know loves the family I’ve created: a small, but loving unit of one often-overwhelmed father, and a little boy that bounced from house to house, until he bounced right into my welcoming arms. I have the same dreams for my son as any other parent might have in Arkansas. He came to me from the Los Angeles County foster system. The state of California, even though it’s still struggling for Marriage Equality, is confident that gay and lesbian families have the love and compassion needed to become outstanding parents. I’m so thankful that I went that route to become a dad. It’s my biggest achievement. It’s the answer to that prayer that day in church. When I was told that I would be the commencement speaker for my alma mater, my heart leapt. I wanted to share with the students about what life is like past high school. I wanted to show them the bigger, broader world that was sitting in front of them, ripe for the taking. I know Jesus would have loved my planned commencement speech about empowering all our youth. And then the call came that I was uninvited to speak. My soul was crushed. As the story unfolded, I had to ask myself what they thought I would say that would be so controversial. It’s been suggested that my message would have been a gay-recruitment of sorts. I can’t imagine a more offensive suggestion. My sexuality would have never been part of the message to the class of 2013. But my message today would have celebrated the fact that my high school –which I’m proud to have attended—has instituted the study of Civil Rights into their curriculum. I can only hope it expands those studies to the rights of all people in the coming years. Eventually, I wrote an open letter addressing the discrimination that I endured by not allowing me to speak at my Arkansas high school alma mater. I felt like I couldn’t keep silent any longer, and needed to let not only the superintendent, but for the wider world to know how much their actions have hurt me and my family. I never imagined my letter would spark such an outpouring of love from hundreds of complete strangers. Most amazingly I also received a surprising confession from a man who once bullied me. Today, he is ashamed, but empowered — no longer ignorant to the pain he might have caused. His moving words hit me in the gut when I read them. This apology was not expected. It wasn’t my intention when I wrote my passionate letter to the school that rejected me. However, it made me know that some good could come out of such an ugly situation. It has also caused me to reflect on my life. God answered my prayers. I became a father. I received the apology of my bully. I live a successful life. And, even though I didn’t get to address the class, because of my situation, now they all know what a wonderful life exists for them beyond graduation. Bryant Huddleston is a gay parent, and television producer.